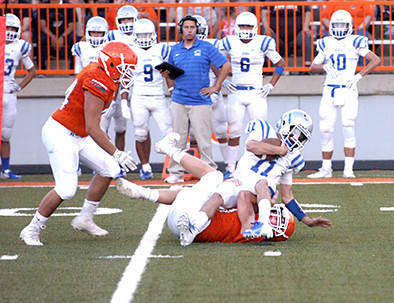 For 18 minutes of football Friday at Bulldog Bowl, Artesia looked to be well on their way to exceeding anyone’s expectations for opening-game execution. The atmosphere was heady to say the least, electrified by the combination of both a new season and the Eddy County War. With orange bearing down from one side of the field, blue from the other, the stadium was standing room only, marching bands blaring, fans screaming, and even a little lightning flashing for added flair. Kicking off a new campaign before thousands of sports-starved spectators can often amplify the “first-game jitters,” but that didn’t appear to be the case for the Bulldogs. 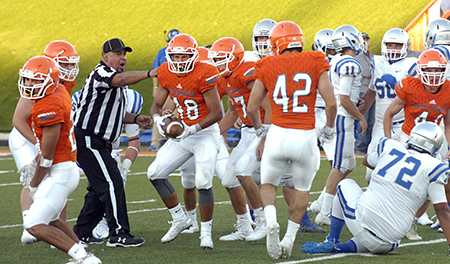 Artesia mounted an efficient, seven-play, 67-yard scoring drive to cap the contest’s first possession, followed up with a fumble recovery, scored again to go up 14-0, and forced a Carlsbad turnover on downs in the red zone, all by the six-minute mark of the second quarter. But from there, it was as if someone began intermittently hitting the pause button. The ‘Dogs looked disjointed in spots as mistakes – both mental and physical – compiled and compounded. The offense would not score again, and the more successful the Cavemen became at sniffing out holes for their running backs, the less time Artesia had to right the ship. With four minutes left in the third quarter, Carlsbad tied the game, and the Cavemen would take the lead to start the fourth. That quarter went on to become a war of attrition for the boys in orange, whose three offensive series ended in a turnover on downs and a pair of interceptions, one for a pick six that rounded out the final, 28-14. It was Carlsbad’s first Eddy County War victory since 2013. 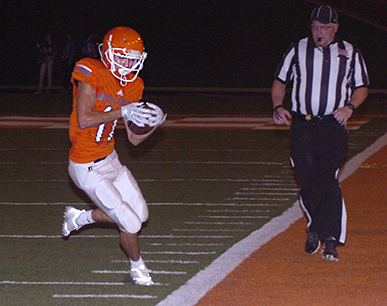 “We made a lot of first-game mental errors last night, and those are things we’ve got to get fixed,” Artesia head coach Rex Henderson said Saturday. “We made some physical errors, too, but there were a lot of thinking errors, and we made a lot more of those in the second half. It was a frustrating turn of events to say the least for a team that was riding high at the onset. The Bulldogs’ inaugural drive was a balanced one, with senior running back Jagger Donaghe carrying the ball from the Carlsbad 41 to the 26, and senior quarterback Trent Taylor reeling off a trio of passes from there, the first to JR Bustamante and the latter pair to lofty target Clay Houghtaling, who scored from eight yards out on the second. Three plays into the Cavemen’s first possession, the Orange Crush defense was able to jar the ball out of the hands of QB Kaden Smith and into those of linebacker Johan Corral at the Artesia 38-yard line. The ‘Dogs capitalized from there, charging into Carlsbad territory on a 43-yard pass from Taylor to Erik Cueto and scoring on a four-yard toss from the QB to Bustamante with two-and-a-half minutes to go in the first. The boys in blue chewed those remaining minutes plus six more off the clock in their second series of the night. But with Smith sacked by both Zach Ingram and Camren Saxon on the drive for a combined loss of nine yards, Carlsbad found themselves facing fourth and six from the Artesia 14, and an attempt by RB Tate Collins was stymied for no gain by Colin Flood. That gave the Bulldogs an opportunity to go up by a trio of touchdowns, but the series stalled to a three and out deep in their own territory. And with Carlsbad setting up shop at the Bulldog 43, the Cavemen wouldn’t be denied again, scoring on seven plays, the last a three-yard plunge by Collins to cut Artesia’s lead in half. Anyone even passingly familiar with the Bulldog offense knows 1:26 is more than enough time to construct a scoring drive. But while the ‘Dogs barreled into range at the Caveman 32 on a 23-yard pass from Taylor to Bustamante and worked their way to the 20 from there, an incomplete pass made them opt for a field-goal attempt, which sailed wide. “We really did a lot of good things in the first half,” Henderson said. “We moved the ball real well. The thing with Carlsbad is, they’re going to run a lot of clock, so your number of possessions is going to be limited. We had four possessions in the first half. We scored on two, went three and out on one, and moved it all the way down the field with not a whole lot of time left on the fourth. The Bulldogs also still held both the lead and the momentum heading into the third quarter, and the defense made a quick bid to keep it that way, forcing a Carlsbad punt from midfield. 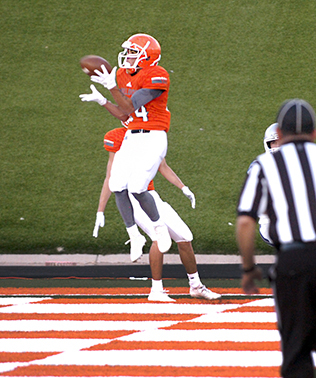 Artesia’s first drive of the second half would end in kind, however, and after a punt return to their own 41, Carlsbad scored on a one-yard run by Smith to tie the game. A turnover on downs by the ‘Dogs in the Caveman red zone further frenzied the boys in blue and their fans, and Carlsbad would open the fourth quarter by smash-mouthing their way back to the end zone on a 15-yard, fourth-down run by Collins. After the two squads traded TODs, Artesia was left with minimal time for a comeback effort but seemed on track, driving from their own 43 to the Caveman 29 with just over a minute remaining. An offsides penalty pushed them back five yards, however, and on first and 15, Carlsbad defensive end Xavier Ingram snagged a Taylor pass and took it 66 yards the other way to make it 28-14 with 53 seconds to go. The ‘Dogs tried desperately to air it out, but two near-misses were followed by another pick, this time by Elijah Etheridge. Etheridge would ultimately fumble, but with only a few seconds left on the clock, Artesia could do nothing with the turnover. “We had a lot more trouble sustaining drives in the second half,” said Henderson. “We were still moving the football, but we were just making a lot of mistakes. I don’t know if the first game finally got to us late or if we were putting too much pressure on ourselves. Sometimes when you’re not scoring, you start pressing harder, and that leads to errors. The Bulldogs finished the evening with 311 total yards of offense to Carlsbad’s 328, 272 by air, 39 by land. In traditional direct contrast, the Cavemen legged out 296 of their yards while passing for just 32. Taylor finished 25 of 42 for 272 yards, two touchdowns, and two interceptions in his first varsity start. Bustamante was on the receiving end of 11 of those passes for 115 yards, followed by Cueto (3-63) and Estrada (6-51). Donaghe finished 12-53 on the ground. Collins did the bulk of Carlsbad’s damage on the contest, carrying the ball 21 times for 172 yards and two scores. Jonah Mathews was 11-80 and Smith 9-32 with a TD. Smith took to the sky just five times, connecting on four. “Defensively, there were some alignment issues last night,” Henderson said. “Again, a lot of that had to do with the mental errors. We also had some tackling issues, and in the fourth quarter, they just out-physicaled us. And we talked about that. Once they got the momentum, we didn’t take it back, and we have to learn how to do that. Henderson says the Bulldogs will be focused this week on reducing their mistakes, and that having the opportunity to see them presented on film will help toward that end. 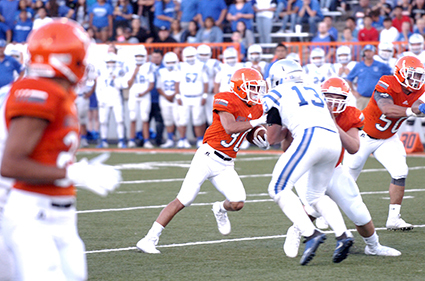 Artesia will be taking its first road trip this week to Hobbs, where the Class 6A Eagles will also be hungry for a win, having dropped their opener to Clovis, 32-21. Henderson feels that if the ‘Dogs can zero in on what went right Friday versus Carlsbad and understand how to correct what went wrong, their performance should be drastically improved. “Through three quarters of football, we were physical and we were making plays; we just couldn’t quite sustain things like we needed to. I think this is one of those games that’s really frustrating for our kids, because they see how close they were. They know how close they were to really winning that game, and maybe not even just winning it but kind of breaking it open.